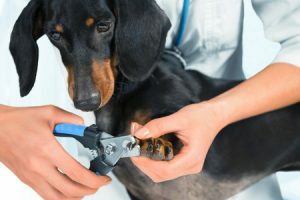 Trimming your pet’s nails can be very intimidating especially with all the things that can go wrong, but really trimming nails is an easy process. Starting the process early in your puppy’s life can make this an easy process. You will still need to keep in mind that your puppy is scared and unsure what you are doing. Reassure them and be confident. The more confident you feel about what you are doing the more at ease your puppy will feel. Having the proper equipment will make you feel more confident in your nail trimming; there are plenty of nail trimmers out on the market. Single bladed cutters that work like a guillotine are best for small breeds. You are going through smaller nails and do not need as much force. Double bladed cutters are best for large breed animals. There are even large trimmers that look like hedge trimmer for extremely tough nails. Make sure you have the proper trimmer for your dog. While you are purchasing your trimmers also purchase styptic powder. This is a coagulant that will stop the bleeding if you trim the nail too short. The reason people are so afraid of trimming nails is because of cutting the quick. This is a vein inside of the nail. If you cut too short and nick the quick your puppy will bleed. To avoid this make small cuts until you get the hang of it. In light colored nails you will see the quick, but dark nails you cannot see it. In dark nails cut right above where the nail starts to curve. The more you trim nails the shorter the quick will be. To cut the nails hold you puppy close and hold the paw firmly. Place your thumb on top of the paw and fingers underneath to spread out the claws. With a short quick motion clip each nail. To remove sharp edges use and emery board.